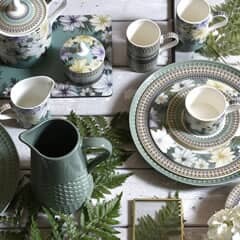 Portmeirion Pottery including Portmeirion Botanic Garden Tableware, Portmeirion Sophie Conran, Portmeirion Crazy Daisy Dinnerware and Tableware. 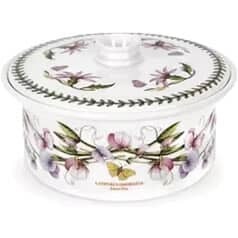 At ECookShop we have a large catalogue of Portmeirion pottery, including popular collectables like the Botanic Garden and The Holly & Ivy sets. We offer competitive prices, provide free delivery on all orders over �50, and we are always available to answer questions about the items we sell. 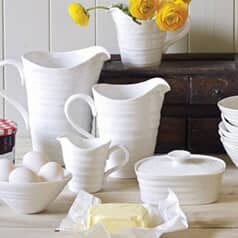 You can either call us, purchase through our secure online ordering service, or you can call in to Dawson's Department Store, where you will be able to view all the tableware and kitchen accessories that we stock. 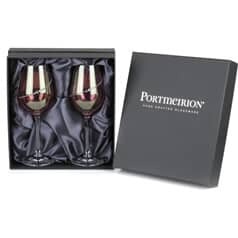 Portmeirion pottery is manufactured and supplied by the Portmeirion Group, who also own and maintain the likes of Royal Worcester. 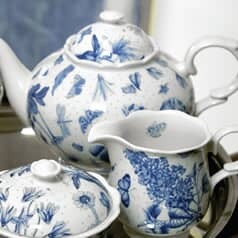 Their teapots, and other items of tableware, have become incredibly popular as collectors' items, as well as for use in the dining room and kitchen. 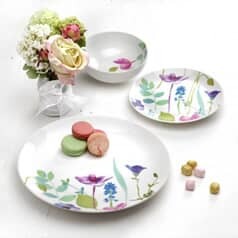 Whether you are looking for full sets, individual items of kitchenware and dining ware, or appealing Portmeirion pottery collectables, there are some beautiful and stunning designs available for you. 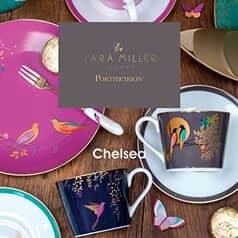 Pottery designer Susan William-Ellis established Portmeirion Pottery in 1960. 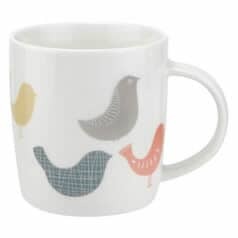 She and her husband, Euan Cooper-Willis, purchased a pottery decorating company in Stoke-On-Trent in 1960 having worked with the company for several years. 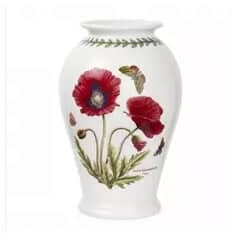 In 1961, the couple bought Kirkhams Ltd, giving them the capability to manufacture pottery, as well as decorate it. 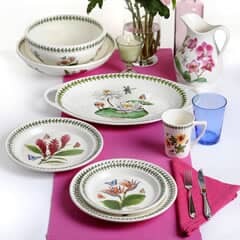 Several popular lines were launched in the first ten years, but it was in 1972 with the launch of the Botanic Garden range that the company really became a name in the dining ware industry. 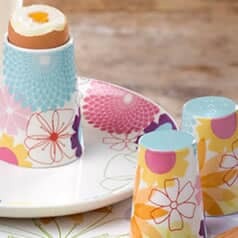 More recent designs have included an officially licensed Ted Baker range and designs from Sophie Conran. 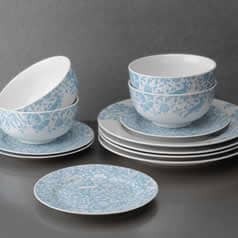 In 2009, the Portmeirion Group expanded with the purchase of Royal Worcester and Spode, after the companies went into administration. This led to additional manufacturing at the Stoke-on-Trent factory. 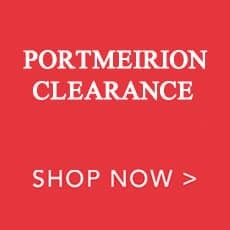 Portmeirion Pottery collectables can be very expensive, with the most expensive being some of the original Botanic Garden, Totem, and Pomona are just some of the most highly sought after. 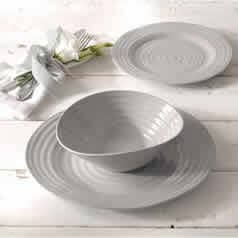 The fragile nature of pottery means that a lot of the older items have become damaged or broken. Whether budget is restricted, or you are looking for items that will become collectors' items in the future, it is worth looking at earlier pieces that sell well now. 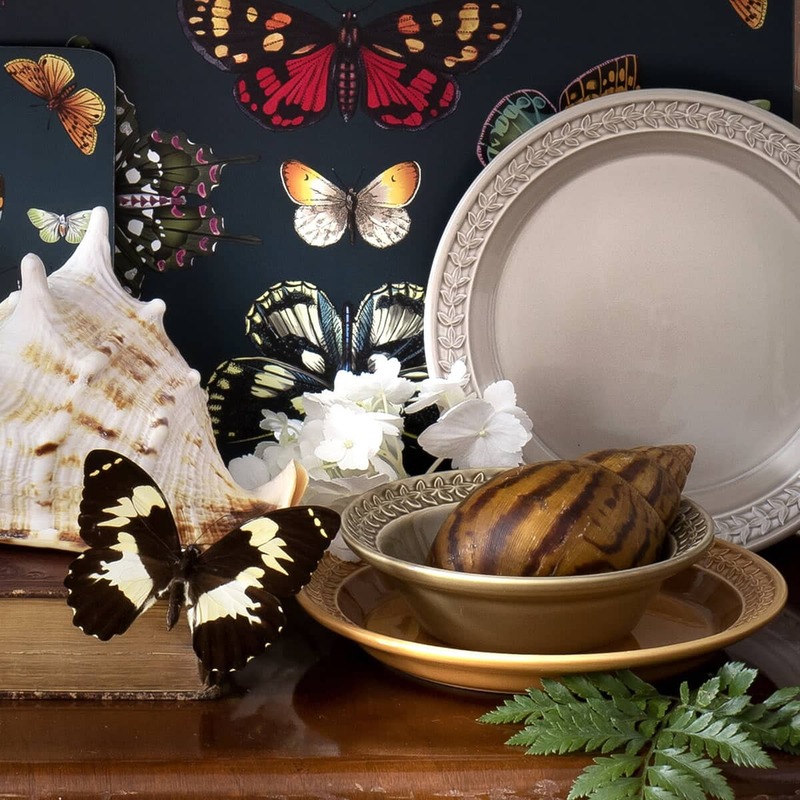 Those that are part of animal and plant ranges have always performed well, and holiday pieces that are found as part of the Botanic Garden range as well as individual sets, are also sought after. 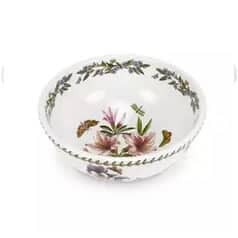 The Botanic Garden is the best known of all Portmeirion tableware. The great thing about this beautiful and appealing line is that it is not only designed to look great, but is designed for regular use. There's no need to lock them away in a display cabinet, or leave them in the kitchen cupboard for fear of them becoming damaged. 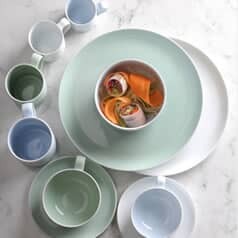 Portmeirion tableware functions very well and is built to last. This range has been updated and remade since 1972. As the name suggests, it is decorated with plants and trees that are reminiscent of those found in botanic gardens across the country. 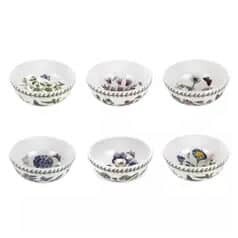 This traditional style is very popular with buyers and collectors, and this is why the Botanic Garden sets are those that are purchased most often. 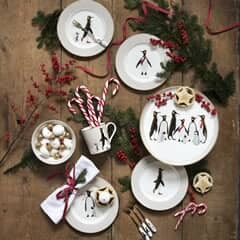 Sophie Conran comes from a family that is renowned for its design abilities. Her siblings include fashion designer Jasper Conran, restaurateur Tom, artist Edmund, and product designer Sebastian. 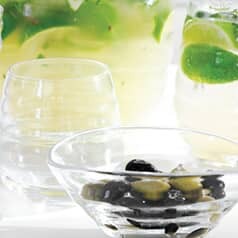 She is also the daughter of Sir Terence Conran, the restaurateur, and Caroline Conran, a famous food writer. With this kind of pedigree, it is hardly surprising that she has made a name for herself as an interior designer, cook, and author. 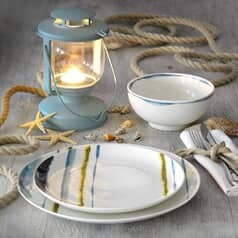 Since 2006, the Portmeirion Sophie Conran range has won plaudits and praise from buyers and publications. 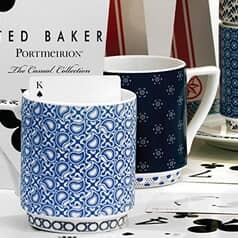 It has won awards from Elle and House Beautiful, and her line remains one of the most popular and arguably best looking of Portmeirion pottery. 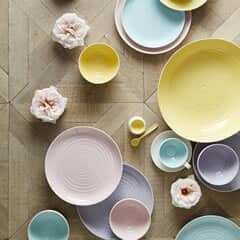 The pottery company also features a licensed range from Ted Baker, another stalwart in the British design industry. 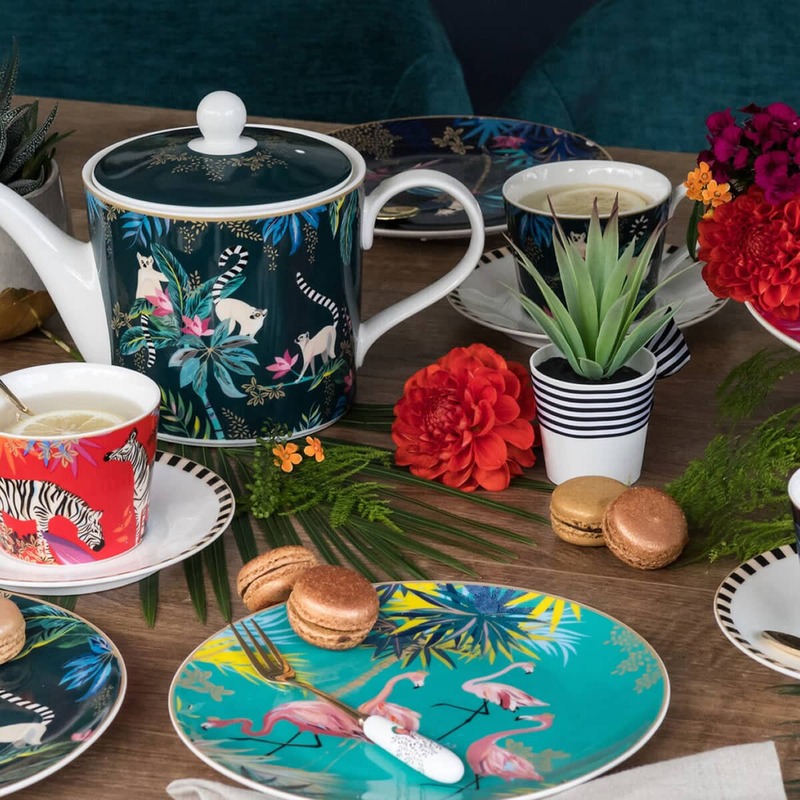 The products, which include Portmeirion plates, cups, and other items of tableware, feature beautiful, fine prints, from the Ted Baker design range. 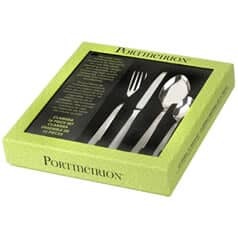 They also incorporate a combination of both fine dining and tea story collection items and every item is available in a gift presentation box, making it the ideal choice as a future Portmeirion Pottery collectable. 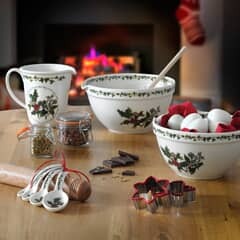 The Holly & Ivy is a collection of Portmeirion mugs, cups, plates, and other items that are perfect for seasonal celebration. 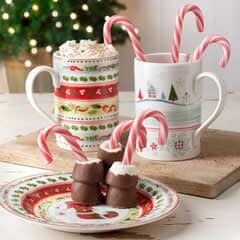 Buy sets of 6 mugs, plates, bowls, and more. 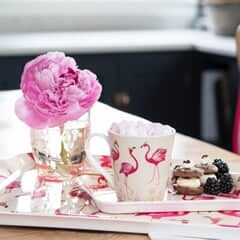 Have them delivered straight to your door with ECookShop's free next day delivery offer (on all orders over �50) and enjoy a traditionally decorated dining set. 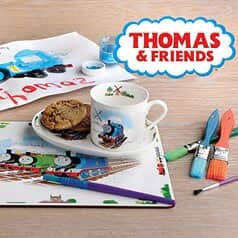 There are many other sets and collections available. 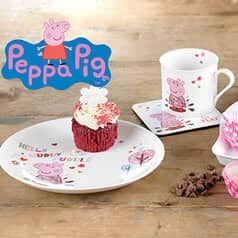 There are those designed with children's favourites like Peppa Pig and the Hungry Caterpillar. 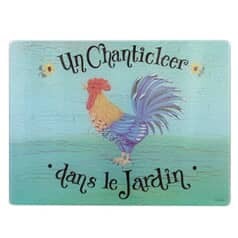 Ordered for the first time arrived next day everything well packaged Prices brilliant for an item I only use in December so dont want to pay to much this site cant be beat. I have just ordered a kitchen aid coffee machine. 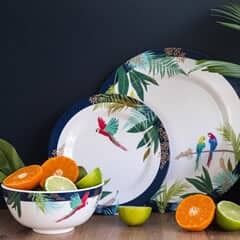 Regardless of whether I order china or electrics I am confident it will arrive well packed and very fast Well done it is a pleasure to shop with you. Excellent service. 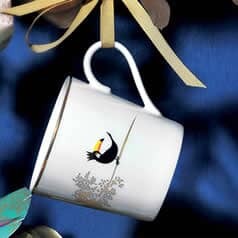 Delighted the the quality of my china. Packaging first class. Very prompt delivery.Prices the best I could find. Would highly recommend this company. 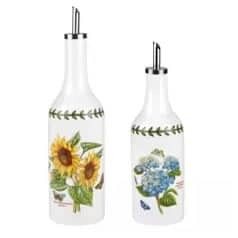 Purchased 3 items from the holly and ivy collection and the items were shipped very fast and very well packed.I would recommend the the ECOOKSHOP and rate them 5- STAR for excellent service. 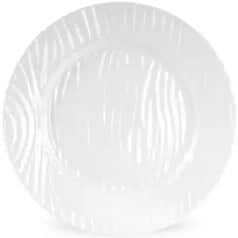 Was concerned when I ordered a set of dinner plates two sets of glasses and various other goodies from the holly and ivy range days before Christmas. I neednt have been Speed of despatch was fantastic and it was brilliantly packaged with loads of bubble wrap. would certainly recommend. Just shows that lower prices doesnt always mean lower customer service. Many thanks.